If you write mysteries or thrillers (or any genre, for that matter), there’s nothing more rewarding than to have someone say your book is a real “page-turner”—that they couldn’t put it down. And there’s nothing more fulfilling for a reader than to find a book so captivating that they can’t stop reading. Naturally, the writer has to develop a compelling story populated with three-dimensional characters and enough conflict and tension to keep a reader’s interest. Those things are givens, and it’s the writer’s job to craft those elements into the manuscript. But did you know that there are some simple formatting tricks that anyone can do to improve the readability of a manuscript and keep the reader turning pages. And what’s really cool is that you don’t have to change your story at all to benefit from them. Not a word. Trick #1. Write short chapters. Whenever a reader gets to the end of a chapter, they must make a decision to read the next chapter or put the book down and go do something else. It’s a natural stopping point or a launching point to the next part of the story. If it’s late in the evening, many times that decision involves continuing to read or going to bed. What you don’t want them to do is put down the book. When a reader finishes a chapter and comes to that late night decision to stop or read on, they usually check to see if the next chapter is short or long. If it’s only a few pages, there’s a really good chance they will read one more chapter. If they get to the end of that next short chapter and repeat the checking process again, they won’t go to bed. They’ll keep reading. And you will have setup a format that they’ll come to expect and rely on. This tip does not mean that every chapter must be short. What I’m suggesting is to examine each chapter and see if you can split it into two. Or even three. After all, the same information is going to be imparted. It’s just going to happen in multiple segments. There’s always going to be a need for longer chapters. Just ask yourself if that 6k-word chapter you just finished writing could be broken into multiple chunks. Remember that you want to entice the reader to keep reading. Now I know that some writers will react by saying, “Well, my chapters end when they end. 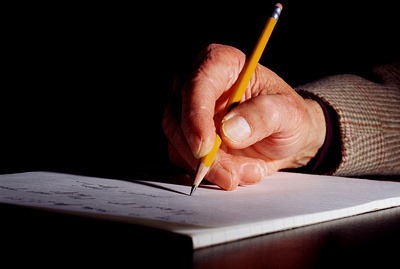 Short, long or in between, I write until the chapter naturally ends itself.” Fine. Do whatever you’ve got to do to write a great story. This trick may not be something that fits your writing style. But from a physical standpoint, readers tend to keep reading if they feel the next chapter will take just a few minutes to finish. From a personal perspective, my co-writer and I try to bring our chapters in at around 1000 words. I know, some of you will think that’s way too short. But one of the most frequent comments we get from our fans is that in addition to enjoying the story, the short chapters kept them up late. We’ve had more than a few readers blame us for them not getting enough sleep because they decided to read “just one more chapter”. Trick #2. Write (or format) short paragraphs and sentences. This trick is closely related to trick #1, but it involves the visual experience of your book for the reader. It also involves setting up a distinctive and comfortable rhythm and tempo to your writing. As you read, your eyes not only move along the sentence but your peripheral vision picks up the “weight” of the next sentence and paragraph. You’re reading a single sentence, but you visually take in the whole page. As your mind plays out the story from one word to the next, it also calculates what is coming up next, and causes you to be subtly energized or marginally fatigued. It’s like driving across the desert—if the road stretches in an endless ribbon to the horizon, you become tired just knowing you have a long way to go to get to the next break, or in the case of the book, the end of the sentence or paragraph. But if the road is only a city block or two long before you start down the next stretch of highway, you feel less overwhelmed by its mass (paragraph) or length (sentence). Shorter paragraphs and sentences keep the eye from getting fatigued. They allow the reader take a mental “breather” more frequently thus keeping their attention longer. And it’s also a tool for controlling reading speed. Shorter sentences move the story along at a faster rhythm and tempo because the eyes moves quicker and your peripheral vision sees less bulk and weight on the printed page ahead. Trick #3. Eliminate dialog tags whenever possible. If there are only two characters in a scene, eliminate as many dialog tags as you can without confusing the reader. The dialog itself should help to identify the character as should their actions. Even with more than two characters present, staging can help to reduce dialog tags. Staging and actions also help to build characters. Dialog tags don’t. If the reader knows who is speaking because of their actions, the number of tags can often be reduced or even eliminated. Trick #4. Title your chapters. Your book has a title for a reason. It sets the mood or intrigue of the whole story. Consider titling your chapters for the same reason. Like the book title, a chapter title is a teaser. When a reader ends a chapter and turns the page, nothing is more boring than to be greeted with the totally original title: Chapter 23. Or worse, just 23. Why not give the reader a hint of what’s to come with a short title. Don’t give anything away, just use the chapter title as an enticement—a promise of things to be delivered or revealed. Use it to set the stage or create a mood just like the book title. I believe that each chapter should be considered a mini book. Chapters should have beginnings, middles and endings. And one way to tempt the reader to keep reading is with a compelling title. Tricks like these are never to be considered a substitute for solid, clean, professional writing. They are only tricks. But they work if used in the mix with all the other elements of a great story. And the only way for you to know for sure is to give them a try. Beyond these formatting tricks, does anyone recommend others that can enhance the reader’s experience? This entry was posted in Joe Moore, writing, writing advice, writing books, writing craft, writing exercise, writing process, writing suspense, writing techniques, writing the thriller, writing tips by Joe Moore. Bookmark the permalink. I never thought about using chapter titles as a means of enticing the reader to keep reading–but it makes scene. On the subject of short chapters, awhile back I was looking at a James Patterson book, marveling at how he could have upward of 123 scenes in a book of only around 300-350 pages. But, what I discovered was, Patterson did not write a scene and when the scene was over end the chapter–like most fiction writers do–he broke up his scenes. He cut to a new chapter, but stayed within the scene (sometimes as many as three chapters make up one scene). As close as I could determine, it seems he would find an “Emotionally cliffhanger”, or turning point with in the scene, cut to a new chapter and write on from there. Thus, a 123 chapter book, still only has 45-60 scenes in it. I found it an interesting concept to hook the reader and compel them to the next chapter. Thanks for your comments, David. Patterson is a master of the short chapter technique. I’ve seen 1-page chapters in his books. When you combine that with a terrific tale, how can you not resist reading “one more chapter”? Most of the readers who’ve emailed me, told me they couldn’t put my book Careful… down said it kept them up late. I structured it with 80 chapters in 350 pages. Whew, that’s alot of chapters to title, but I’ve found the short chapters push the story forward. Personally, I can’t seem to tolerate long chapters – it’s like being on that long highway you describe. David, you give a wonderful example with Mr. Patterson’s work. I love the pacing of his scenes. Big blocks of text drive me crazy. BTW, Joe, I’m leading my local book club at Riverstone in North Georgia next month and I put The Grail Conspiracy up as one of the choices. That’s a great book you and Lynn Sholes put together, and I personally love the way you put those chapters together. I’ll let you know if the group picks it. It’s fast, and it reads so well it kept me up late. Thanks for writing it. Thanks, Paula, and congrats on the positive feedback on your book. BTW, I also wanted to thank you for the glowing review of THE GRAIL CONSPIRACY on Amazon. After 7 years, that book just keeps on trucking. Thanks again. I heart this post to infinity squared. Shorter, tighter, and eliminating those idiot dialogue tags so beloved of so many. “said” and “asked” are all you find in my WIP with the vast majority of the dialogue (and there is a lot of it) untagged. If I need any kind of emphasis, I add a gesture or other action. “You said you needed an eleven-letter word for legal proximity. The word you want is propinquity,” said Jo as she dropped a handful of peeled, chopped limes into the blender. “What kind of a dumbass word is that?” said Sasha, tossing the magazine aside. Again, whether the whole book works or not is still in progress. Just wanted to show you that I subscribe to every word in this post. “You said you needed an eleven-letter word for legal proximity. The word you want is propinquity.” Jo dropped a handful of peeled, chopped limes into the blender. “What kind of a dumbass word is that?” Sasha tossed the magazine aside. Joe, Excellent advice. One of my favorite writers, one who truly kept me reading long past my bedtime, was the late Robert B. Parker. He wrote short chapters, didn’t use speaker attributions to excess, and made me want to read “just one more chapter.” I’ve tried to emulate his writing style to this degree, but no one will ever replace him. Thanks for sharing some excellent tips. I love these tips, Joe. I’ve come to similar thoughts on page turners, especially the shorter chapters & the eye’s need for white space on the page (ie shorter paragraphs & dialogue). Chapter titles would be new for me. An interesting idea. I agree that each chapter & even each scene is like a mini-story. First lines & endings should be written with the same care as the first line in the novel. I would add another page turner technique that I love to use is splitting up a scene at the end of a chapter that carries on at the top of the next one. Leave that split at a moment of anticipation of something about to happen. This could be an action sequence cliffhanger or something as simple as a mystery man about to be revealed by walking into the room. Thank you, Richard. If you’re going to fashion your writing after another author, do it with the best. You can’t get much better than Parker. Jordan, glad you like the tips. I use your additional tip all the time, but with a twist. I stop a chapter just at the moment of anticipation as you suggest, but don’t start the next chapter with a continuation. Instead, start it with a continuation of the previous chapter. It’s called “bait and switch”, a term introduced to me by my friend and our fellow blog mate, Nancy Cohen. She’s one smart lady. I just got back from a conference where I taught a workshop on page turning techniques. I reminded the people that this isn’t just for thrillers. EVERY novel needs to be a page turner, and can be, if done right. Which is why I wrote a book (*shameless self-promotion alert*) called Conflict & Suspense. It’s for “character driven” as well as “plot driven” stories. Re: Short chapters. Something within me resists splitting up a scene into two or more sections, just to get the feel of “short chapter.” For some reason, it feels to me like the author is overly manipulative (apologies to Mr. Patterson). In my Try series I have short sections, but I conceive them as cuts to different locations or perspectives, as in a film. They are cinematic and therefore have a reason for being, not just to get a reader to turn, or click or swipe, to the next section. All good points, Jim. Like I said in my disclaimer: “Tricks like these are never to be considered a substitute for solid, clean, professional writing.” These tricks are just a few of the many tools that writers should have in their toolbox. WOW! So many great tips in this post. An area I especially need to work on is shortening paragraphs–and varying them more. I confess, the thought of titling chapters causes me stress–if naming chapters is anywhere as traumatic as titling a book, it’s torture. Last but not least–I totally understand the rationale for shorter chapters. But I’m just curious–does anybody besides me get annoyed at really short chapters? Of course I grew up reading westerns–so they probably had longer chapters than what is in print today, but still…too short chapters are like fingernails on the chalkboard to me. Thanks for the feedback, BK. Titling chapters might prove easier that the title for the book. Once you’ve written the chapter, there’s always something–a word, phrase or action–that reveals itself as a possible title. At least that’s been my experience. And I try to keep the titles as short as possible. Usually 1-2 words. As far as liking or not liking short chapters, I guess my feelings would be based on their content. If the content is strong, it pushes me forward no matter what the length of the chapter is. These are great tips, Joe, and I know you are a master of the page-turning art form. I’d never thought of adding chapter titles. It just seems like more work, and more requirements for our creative energy. Plus when I read, I don’t really care if a chapter is titled or not. But each to their own. Maybe I’ll try it in a future work. Begin and end each paragraph with a short sentence. Put longer ones in between. This helps build momentum going into the paragraph, and the short sentence end is a rhythmic “push-off” to the next chapter. When I was pre-published, a famous writer who critiqued my manuscript said to keep my chapters about the same length. He said that when readers are first getting to know you, you need to keep chapter lengths similar to avoid surprises and reader interruptions. In my series, I use chapter intro’s–each one is a quote from a “book” that provides a nugget that is related to the action in each chapter. I have now developed a small library of fictitious books, which I quote at the beginning of each chapter. Nancy, when you get into the habit of titling your chapters, it becomes hard not to. Most times, the title writes itself. Try it. Kathryn, more great additions to the tips list. Thanks. One of my favorite authors, Payne Harrison, uses the quotes technique to intro his chapters. It takes a lot of research, but it sure pulls a story together when you find just the right one. As for paragraph weight, that also changes. My daughter squeezes the font size down until it screams; I run mine on large or extra large so my old eyes can see the letters. I admire greatly people who can read a novel on a phone screen. Wish I had eyes like that again. Which makes me wonder if we should worry less about how it looks on the print page and focus more on the things like the short-sentence rythyms mentioned earlier and being sure to use hooks coming into every chapter and prompts going out. Great Post, Joe. It’s a keeper. Perfect Joe! And it goes to show that even an impromptu beta read will always hone in on the spot you’ve been tripping over! Hi Kathy, my tips are primarily for print. Naturally, once you get into digital with adjustable print and font sizing, the rules can change. But it still applies to chapter titling and short chapters, sentences and paragraphs. Thanks for your comments. Don’t forget, Terri, that you can throw the staging in front of the dialog, too. Joe, I know what you are saying, but am having trouble picturing it (long day in my cubicle). Give me an example (pretty please). Joe, thank you for those great tips, particularly #1 and #4. I grew up reading books that always had chapter titles. I notice that the practice seems to be coming back, and that’s a good thing. Kathryn, I LOVE that idea of putting short sentences at the beginning and end of the paragraph. I’m going to start using it. Thanks! Joe, you rule . . . and DUH! First week of my diet. That’s my story and I am sticking to it. Apologies for chiming in late, Joe, but GREAT info! Thank you. I’m off to title a few chapters! Great post and definitely worth a RT… I titled the chapters in my 1st book and then wondered about doing so for the 2nd in the series. Apart from keeping consistency… I think you’ve helped me decide for sure that I want to go with titling chapters in all my novels. All great and impactful ideas! Thanks for dropping by TKZ, Anju. Glad the tips helped. Great ideas here– I do title my chapters, and I’ve noticed that some books to use short chapters, but I’ve never really understood why it’s beneficial. Thanks!